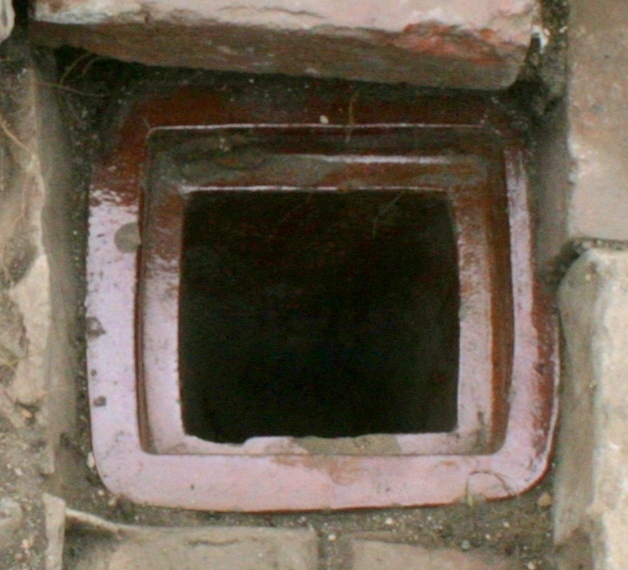 Ceramic drain in front of junction of scullery/kitchen and wood-store. 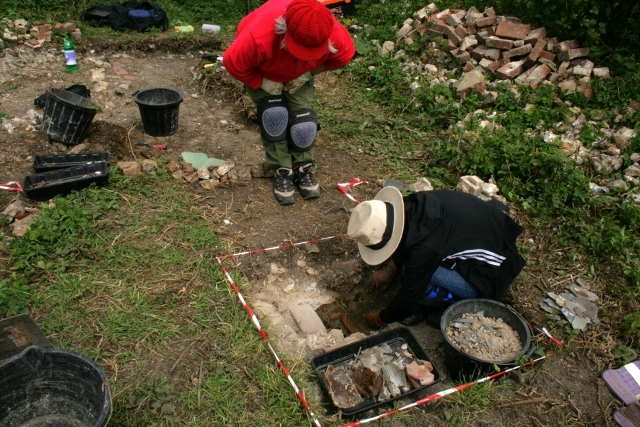 Excavating ceramic drain in front of junction of scullery/kitchen and wood-store. 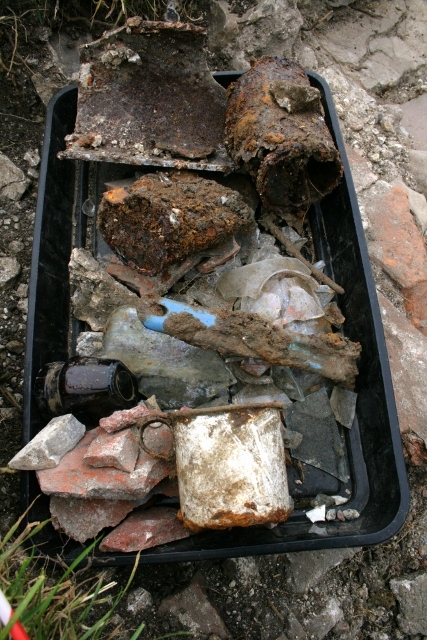 To put things simply – our dig has gone down the drain – and some really nice finds were recovered out of it! Looking E from path between toilet and front door to house; excavating 1m x 1m square midway between front garden gate and front of house. 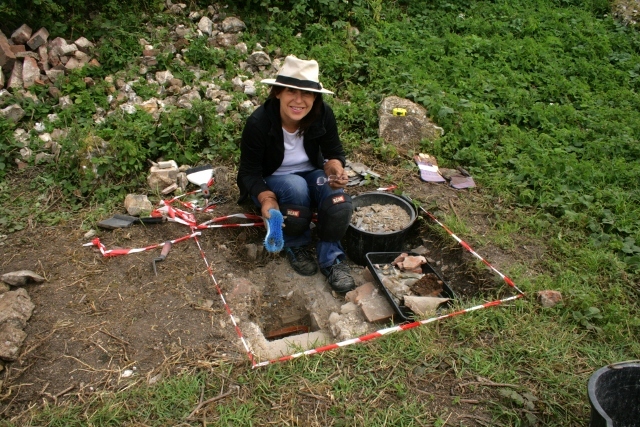 Our main objective for this part of the dig is the location of a reported ‘well’. So the excavated area in front of the house was extended by 1x1m – midway between the front door and the front garden gate – and still no sign of any such structure was found. There is now just an area of 1.5 x 1.5m directly in front of the house where this illusive structure might be located. A yellow bead, a button, a small variety of glass shards, a few nice ceramic shards, a live .303 bullet dated 1940, a very small quantity of bone, an even smaller quantity of wood, and lots of rusty nails made up most of our finds. Looking S at drain in front of house at junction of scullery/kitchen and wood-store. Meanwhile, last Sunday’s grid square, over the junction of the kitchen and woodshed walls at the front of the house, was further cleaned up – and a ‘beautiful’ shiny brown salt glazed stoneware(?) drain was revealed. It was a pity that a volunteer who is a retired plumber had called earlier to apologise that he couldn’t join us – just when we needed him! Gulley drain in front of junction of scullery/kitchen and woodshed; (W at top of photo). It was square in cross-section, but with very slightly rounded edges and corners. It had a recessed lip which would have held a grating. Its external width was about 9″, with its lip about 1″ in from the edge, about 1″ deep, and 1″ wide, suitable for a grating of about 7″. Looking down gully drain with openings at base to east. It was about 12″ deep, narrowing down to its base at a width of approximately 4″. It seemed to have two outlets; the lower one leading off horizontally from its base, about 2″ high; and a second outlet approximately 1″ above it with an opening of about an inch high. A little Internet research has revealed this was a ‘gully drain‘ to divert rainwater from a gutter and/or down-pipe to a drain-pipe beyond. 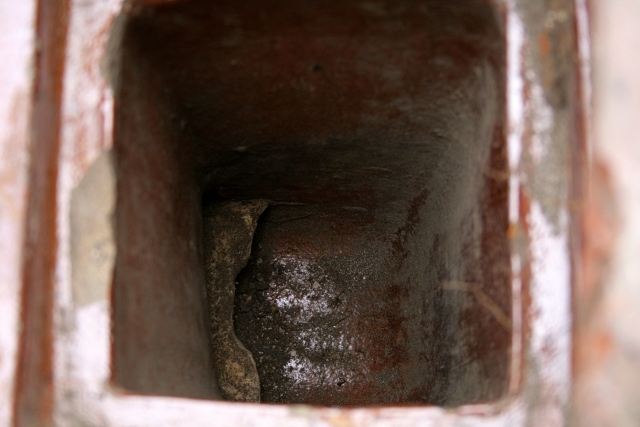 The Paving Expert website suggests that the lower outlet may have been to trap silt, whilst the upper outlet may have been to enable rodding through any blockages in the drain-pipe beyond. 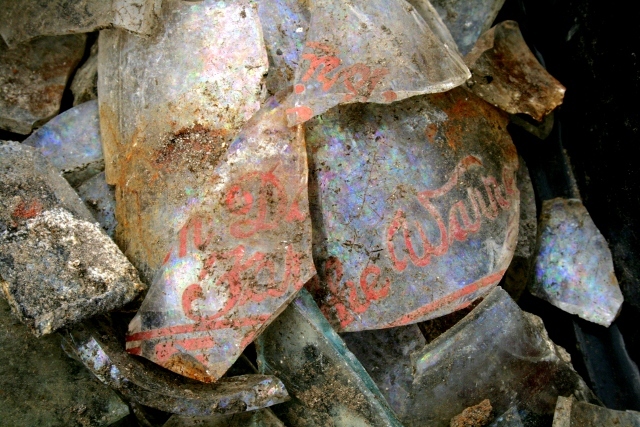 The whole was contained by bricks and mortar. To its west, and at a slightly higher level was a wide shallow concrete gutter abutting the front of the house. It had an outlet to the east, presumably diverting rainwater under the path to the wood store, via a drain-pipe, in the direction of the vegetable garden – where it would have been much appreciated. Was this an overflow drain from a water-tank directly in front of the house? 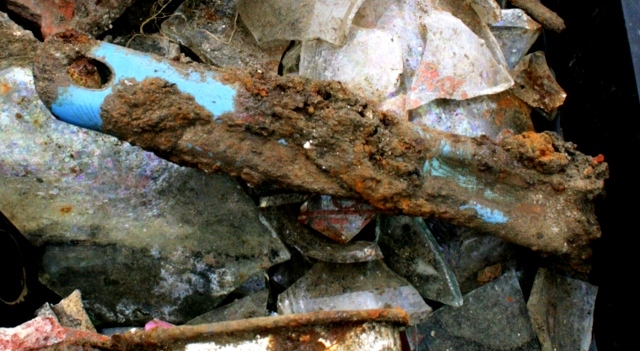 It may have been filled by rainwater from both the house roof and an overflow from the big rainwater tank in the nearby barn to the north-west – it was from this direction that a cast-iron pipe has been found heading in front of the west side of the house, though it had been chopped off, within a foot or so of the west end of the house. 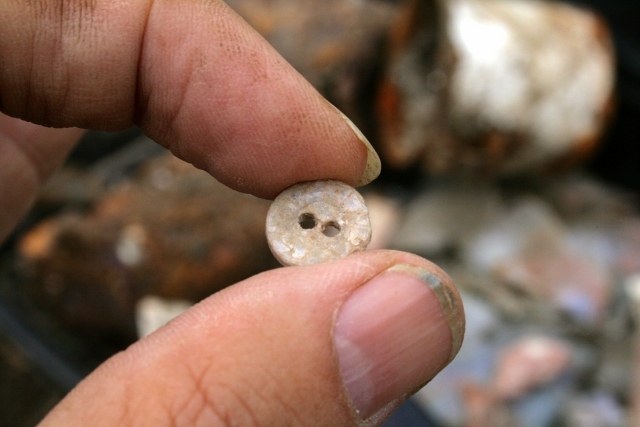 Just as exciting were the finds which were found buried in the drain and its immediate vicinity – they were notable for both their quantity & quality. 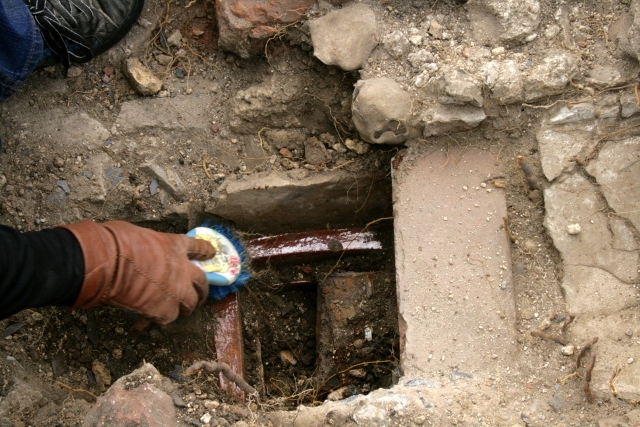 The finding of this drain has led to my earlier plan being revised, and I now feel we need to excavate all of its adjoining grid squares in front of the house to enable a full understanding of its context, including whether it was part of an overflow system from an underground water-tank located in front of the Latham’s kitchen, between the front door and this drain.